You are here: Home / Blog / What Are Country Proposals to the Global Climate Deal? 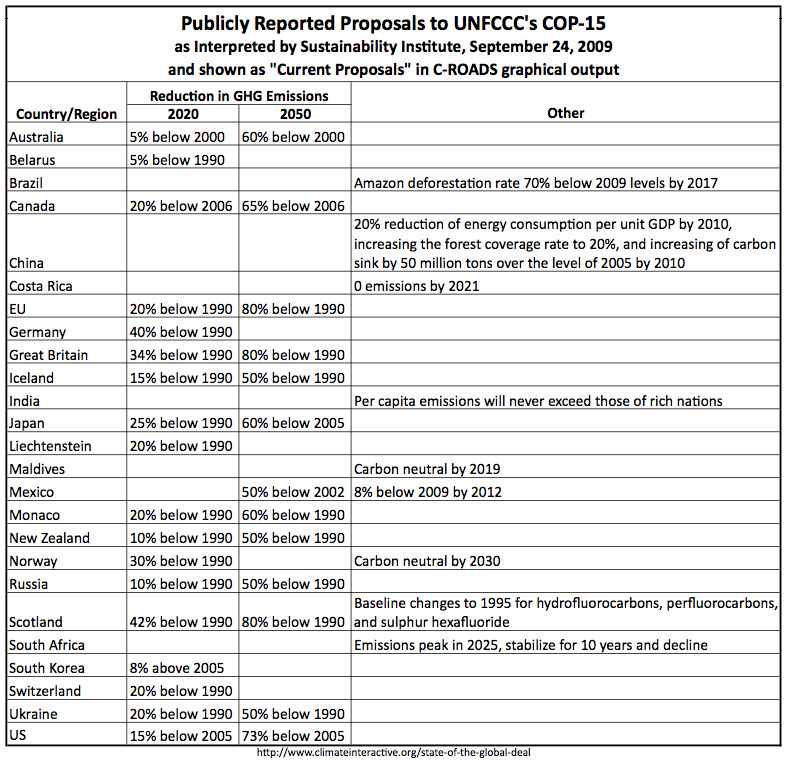 What Are Country Proposals to the Global Climate Deal? The Climate Interactive team has been combing the websites and public statements of various countries, in order to assess the state of the global deal to address climate change. The table here is the result of that research. Check it out here and see all the references here. More and more commitments every month, and still much further to go! For the EU, you use the EU target or goal, 20% below 1990 levels by 2020. For comparison, the EU cap and trade cap, covering 40% of EU emissions, is 21% below 2005 levels by 2020. For the US, you use the WRI estimate pertaining exclusively to the main cap and trade component (covering 85% of 2005 emissions and capping them at 17% below 2005 levels by 2020) resulting in a 15% reduction from US total GHG emissions levels in 2005, by 2020. What’s unclear to me is why, for the EU, you look beyond the cap and trade part, but for the US, you only look at that component? Your U.S. figures come from this WRI analysis: http://pdf.wri.org/usclimatetargets_2009-06-25.pdf . But this analysis *also* estimates that all the US policy components taken together could yield 33% below 2005 levels by 2020 (23% below 1990 levels). This estimate is consistent with, the *explicit* economy-wide *goal* in Waxman-Markey of 20% below 2005 levels by 2020 plus the additional ten percentage points reduction in 2020 from avoided international deforestation (additional to the “economy-wide goal”) also called for explicitly (and relied on in the WRI analysis). Even without detailed analysis of policy components, these two factors, explicit in the U.S. bill, yield a U.S. goal of 30% below 2005 levels by 2020. Thanks for any and all clarifying comments. Thanks for the questions, which provided a good push to examine our assumptions about what scenario to use for the US, with the goal of comparing scenarios from different countries as consistently as possible. As you point out, the WRI analysis also suggests that reductions under Waxman Markey could be somewhat higher. Given the uncertainties around international offsets, we’ll stick with the middle range scenario for our October report. Keeping in mind our purpose of showing the general long-term trend that could be expected if current proposals were implemented, I compared all three scenarios in C-ROADS. Each scenario included the current proposals described on our scoreboard page and one of the three interpretations of US reductions under the American Clean Energy and Security Act. For long-term indicators like global atmospheric CO2 concentration or global temperature increase the results were not significantly different. Given the uncertainties in the climate system, as well as the uncertainties about what climate legislation will actually make it through the legislative process , we think the mid-range scenario is, for now, a good representation of the contribution the US might make to global emissions reduction. One caveat about the big picture comparison. The US targets matter in several different ways. The main impact of stronger US targets may be the effect on the likelihood of other nations sticking to and/or strengthening their targets. Presumably, US targets have some kind of non-linear multiplier effect. Using C-ROADS in the way indicated above shows what happens, assuming x,y, and z. But not what happens to y and z when you change x. For this reason, while I like the snapshot picture this post provides, it seems really tricky to use for the comparison purpose in your response above. Thanks again so much, and I look forward to seeing more of your work. You make an important point about representing the potential that could be released in other countries in response to strong action by the US (or other parties). Stay tuned for our mid-October update of the ‘scoreboard’, were we will represent the sort of conditional scenarios you mention (for instance, the EU’s statement that their 20% reduction by 2020 could increase to a 30% reduction with a strong global agreement, or the conditional position that has been reported in some news sources for Indonesia). Our plan is to show rather than a single curve, a range of possibilities from conservative to more optimistic, highlighting the possibilities that could emerge as commitments from some parties create the possibilities for additional commitments from others. What do you think? Would that be useful? Is there a better way to represent the issues you are referring to? I think that’s very useful. When you use the tools in talks with policy makers, the sequence of the presentations captures the dynamic relationships (along the lines of the qualitative-level “if, then” relationships captured by the narrative order in Drew’s TEDx talk, http://www.youtube.com/watch?v=CTS9RY1z_i8 ). But if these relationships were baked into the model (exogenously, to be sure, but automatically included in any run) this would “land the insight” more readily and prevent some risky misunderstandings and misuse. I realize it would complicate stuff a lot, but I wonder if the next step doesn’t have to be to bake these relationships (conditional positions) into C-Learn and C-ROADS, so that when I, say, change the input on http://forio.com/simulation/climate-development/index.htm for developed nations (for instance) from -20% by 2020 to -40%, this triggers changes in the gold and purple curves, too, based on existing proposals and/or expert opinions. Or, perhaps, the changes are simply triggered based on another input parameter (value provided by user), called global impact, or global deal impact, or something. Either way, the results could show up as a range of curves, as long as it doesn’t get too messy, visually. If you use the “other input parameter” option, and the interface features this parameter prominently enough, this could really drive the point home. This would be simpler although perhaps not as ambitious and “accurate” as drawing on actual conditional proposals or expert opinion on conditional effects. Or maybe consider doing both, if there’s an opportunity? If what’s coming mid-Oct is anything like this: Wow! I’m guessing the user-provided input version would also focus more explicit attention on these conditional relationships, teach more of us to talk in the “conditional target language,” maybe resulting in negotiating positions being more transparent.